This is the healthiest thing I’ve eaten all week. But also the most delicious. 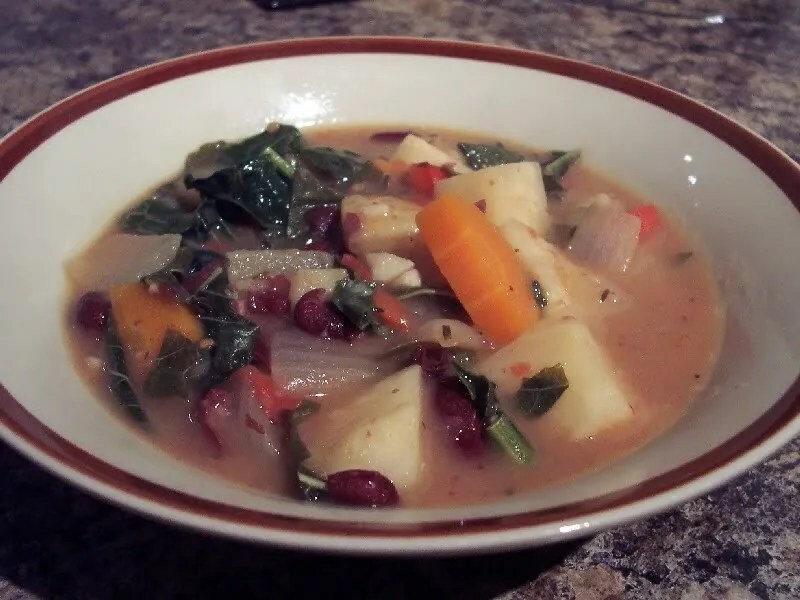 It has about eight million vegetables in it: celery root, potato, carrot, onion, garlic, sundried tomatoes, red pepper, dinosaur kale, kidney beans and local callaloo! Well, actually, I think almost everything was local, as I made it to the market this week. I started off with an almost-roux: a bit of olive oil cooked with a bit of flour, but I added in the onion early because on my hot gas stove the oil started to smoke a bit and I didn’t want to set off the alarm. Anyhow, the flour browned nicely while the onions caramelised and it was a very good base, after all. Then sauteed with the garlic and root vegetables for awhile. Then deglazed with a bit of white wine, added vegetable broth, thyme, marjoram, rosemary, tamari, a touch of balsamic vinegar, then simmered it all for awhile. Oh, and I thickened it with a bit of flour/water slurry a few times, playing it by ear. Added the greens and beans about 10-15 minutes before the end. Soooo good!